Occupy Hong Kong No More! The Occupy Hong Kong Movement was dispersed. After polite requests and court orders, policemen and security guards moved in to move out protesters. By yesterday evening the open air plaza underneath HSBC was clear, even if iron grilles prevented entry. Occupy Wall Street began one year ago this week. Started by a Canadian group called Adbusters the early days were meant to mimic the Arab Spring – a way for the dispirited to call for and make change. Having started in a pocket park in downtown Manhattan the Occupy Movement spread like wildfire. According to Wikipedia, by October 9 Occupy protests had taken place or were ongoing in over 95 cities across 82 countries, and over 600 communities in the United States. What has the Occupy Movement achieved? Without doubt it shifted the debate on financial institutions, bank bail-outs and CEO remuneration. It has increased public recognition of the need for regulatory reform and greater oversight. It has provided a forum for massive public discontent with the global financial crisis. From Day One the Occupy Movement chose not to have identifiable leaders. 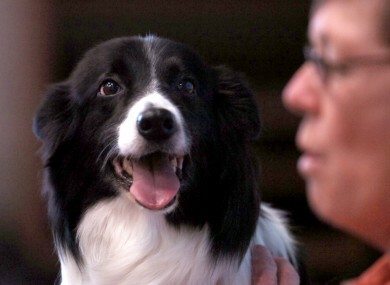 In Denver, Colorado a border collie named Shellby ran into a circle of decision-makers just as they were deciding on which platform of issues to focus on. The dog’s barks were well timed. It was nominated leader. “She’s the youngest leader of a revolution in history and the first of any occupation so far, but she’s smart, so people know she won’t make any situations. We just have to make sure she doesn’t get arrested,” said Peter John Jentsch, the owner and self-appointed ‘bodyguard’ of new Occupy leader Shellby. The downside of a leader-free movement is the lack of cohesion, direction and identity. We the public need a face to identify with when we turn on the news or look at YouTube. Providing a collection of speakers and voices and opinions and platforms only serves to confuse. Some believe the Occupy Movement may morph into a broader political force, like the Tea Party in the USA. This grassroots movement began as a protest to large, inefficient government and is today a powerful force in US politics. Today the Tea Party has a number of supported politicians elected to Congress and the backing of powerful and wealthy business leaders. And still Occupy has no leader, other than Shellby. Yesterday in Hong Kong the protest ended in a scuffle, not a whimper. Protesters ignored a court order to leave by 27 August, and then an on-the-spot demand by police to disperse within an hour. Several protesters were dragged away (see video below). Three security guards were injured in the melee. Today the plaza under the HSBC building in Hong Kong is empty. At least until Sunday. That’s when the Occupy Chater Square movement returns. 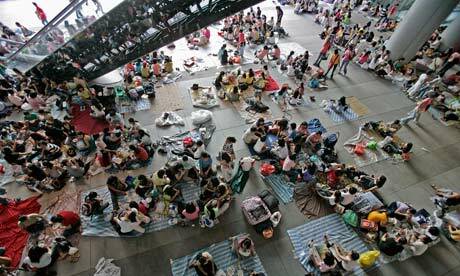 This is an “only in Hong Kong” event as all domestic helpers in the city get the same day off. Every Sunday tens of thousands of Filipinos, Sri Lankans and Indonesians coverage to spend time with friends, gossip and share food. “I strongly believe that citizens have the civil right to stage protests in public areas,” said Alan Chiu Chun-ming, a member of Occupy Central movement. For the many domestic helpers displaced during the months of protest by Occupy Hong Kong, there’s widespread agreement. Only in their case they want the public places to meet – not protest.